Dubai: Given its chequered history, the Dubai Pearl master development has learnt to take the cycles that are a feature of the real estate space in its stride. "We're not expecting the end-user market to bounce back immediately, but around 2012," said Santhosh Joseph, president and CEO of Dubai Pearl. "A real estate cycle takes up to three and a half years to run its course." Not that this means the present is going to be an idle phase for the developer. There's much to be done to keep Dubai Pearl busy. 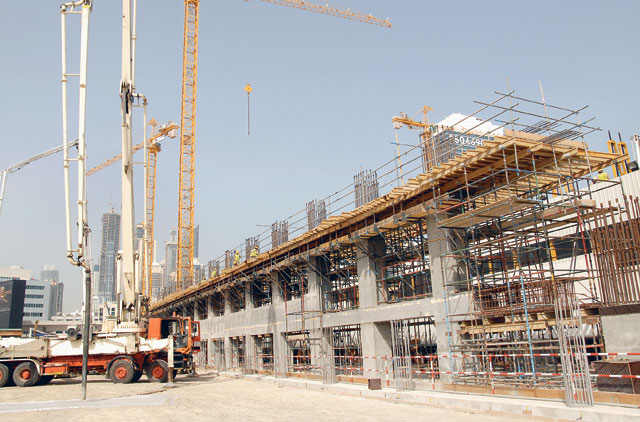 While approvals were in place at the beginning of 2009, construction had been rather slow despite a main contractor coming on board in November 2008. The last two years have not been easy for any developer, but Joseph hinted that instead of skimping on components the developer actually added additional features to its projects. A delay was also caused due to renegotiations with Al Habtoor Leighton. Additionally, the first phase of a project technically takes more time to build. "We also had to look at the finances, we were continuing but not at the same speed [as] it should have," Joseph said. Around 28 per cent of the project's assets have been so far sold, including 25 per cent of the residential and 65 per cent of the commercial space. The DIFC was going to buy one of the high-rises, but the deal got stuck at the signing of the memorandum of understanding. The deal is now being restructured. Joseph reckons that pure debt to finance would not be an option until the project nears completion in two and a half years. "Right now we're planning to guarantee finance to complete with an equity, quasi-equity and receivables model." Payments from buyers are not always forthcoming, with many complaining about the delays and their own financial issues. However, Joseph said no one has pulled out yet and are actually happy with a later hand over date, set to begin in 2013. Investors get a reprieve as this means their payments are pushed back too. Additionally, by that date it would be easier to sell or rent their units. Buyers can adhere to the existing payment plan and pay the last 33 per cent after completion or swap to a construction-linked schedule. "It was not planned that way, but evolved into that and suited them, us and the market," Joseph said. "Customers delayed payments and we helped them restructure rather than outsmart each other. They are maturing and starting to take a longer-term view." Dubai Pearl aims for the height of luxury, with a 1,800-seat theatre, seven hotels and wellness facilities. While the total project cost exceeds Dh10 billion, as per Joseph, the distinctive features will make the project successful, particularly in the absence of buyers. Dubai Pearl intends to use a mix of hospitality, retail, F&B and entertainment components to lure investors. The ‘entertainment district' will come with an upmarket pedestrian ambience and incubate local talents through shows and musicals. Artists could also perform in the local square. "We wanted to create a spirit in the project, seldom seen in a Dubai community, where everyone mixes," Joseph said. "The boundaries can only be broken by offering areas which don't have them, like music or fashion, cinema, humour and dance. "The mix represents very valuable assets and we'll be able to either hire them off or dilute our position in these and bring more capital into the project. "We're already speaking to foreign investors about these options which would take their capital out and make profits later." Although he made it clear that there would never be a repeat of the situation as in 2008, Joseph believes Dubai's mature infrastructure allows property to demand values as in any other global city. While some bought similar residential units for as little as Dh1,200 per square foot and some for as high as Dh5,000, Joseph pegs the future realistic value at Dh3,600. The average sales price of the 1,455 units was Dh3,200 a square foot. To prevent flipping the developer allowed no more then two units per buyer. However, those who bought at peak prices have since got a 25 to 30 per cent discount by passing on the lower construction costs to equal out the price paid. Office space — a total of 2.5 million square feet — is priced at an average of Dh1,800 a square foot and the developer insists on maintaining it that way. "Quality commercial space is well occupied," Joseph said. "The Arjaan building for example is 90 to 95 per cent occupied at over Dh230 a square foot shell-and-core." The developer is equally confident that the 75 per cent of residential space left to sell will eventually be snapped up, reasoning that there may be around 18,000 units coming on-line per year over the next four years. But after that the pipeline stops. "I have to believe in the population growth, around 60,000 people or nine per cent growth," Joseph said. "Not everyone will be buying, but quite a few will at the high-end. "The cost of living has gone down and people will shift their base to Dubai. Its is a well-connected hub, and the lifestyle and security are things you look at when you're affluent." As far as the 35 per cent left in the office space is concerned, Joseph banks on higher tax rates in Eur-ope pushing corporations to establish their headquarters elsewhere, including Dubai. The seven hotels — including MGM Sky Lofts, Bellagio and Bacara — have been carefully chosen to add value to the project and as the new brands are not overexposed in the region. "The hotels will take longer to open from 2013 onwards as it isn't wise to open all of them at one go — it would cannibalise the ambience," Joseph said. Dubai: While the Dubai Pearl has many unique aspects, it also represents one of the few developments taken over during the peak years of the emirate's real estate boom. It started with Qatari Omnix selling the project back in 2004 to investors and starting construction in 2006. But after reaching the eighth level, the Dubai Pearl traffic signs were taped over. The current developer has the Al Fahim Group and family as well as Santhosh Joseph as its shareholders. They bought the project from Tecom in early 2007 and re-launched it by the end of the year. The next year was mainly spent demolishing the existing structure. They started developing high-rises in mid-January 2009. The traffic signs are back, but Dubai Pearl is not the same. Joseph, president and CEO of Dubai Pearl, explained the reason: "Due to the shape, 30 to 40 per cent of the area was wasted, and Feng Shui was also not good, energy is very important." The high-rises were rebuilt from the bottom up, meaning the surrounding car park could only take 2,000 cars, now 3,000. Practical issues aside, the market's ups and downs called for more changes. An office oversupply became apparent, the developer changed the design-mix in favour of residences. And to become Leed Gold pre-certified meant further design approval delays. "Along with smart home technology, sustainability will make sure end-users don't pay abnormal maintenance fees, but around 20 per cent below market and give us good carbon credits," Joseph said. Dubai Pearl will also launch a facility management company integrating all aspects of building management to keep tab on quality living well into the future.